A patent filing published by the U.S. Patent and Trademark Office on Thursday reveals Apple may be looking to build a so-called "convertible" computer, which features a base station and separate wireless display that features wireless power transmission technology. Apple's "Wireless display for electronic devices" basically describes a computing system that has already been brought to market by other manufacturers, but adds inductive power transfer into the mix. With the rise of tablets like the iPad, it is unlikely that the filing will see use in a consumer product, though the idea of including inductive charging into a convertible is novel and could be extended to other devices in Apple's stable. 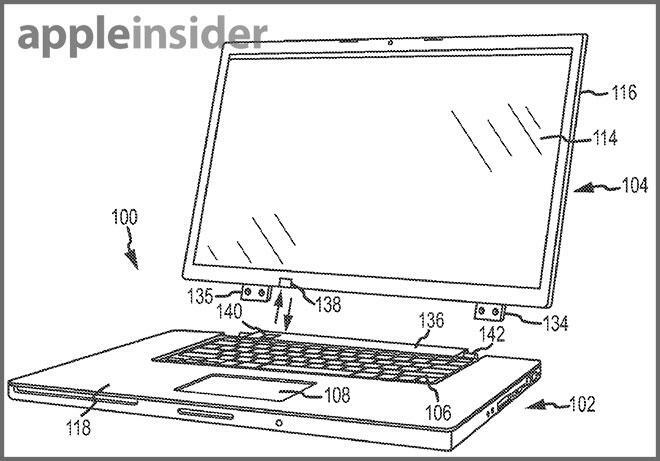 The application reads like a normal convertible laptop, complete with rotating, detachable display that communicates wirelessly with the "base," which in today's MacBook Pros would be the unibody chassis. Various protocols, including Wi-Fi and Bluetooth, are tasked with transferring data to the display after the hard lifting has been completed by the base station's CPU and GPU. Notably, the display unit can be charged via hard connections that are integrated with the hinge, or by a wireless power transfer technology. It is also mentioned that the display is touch-sensitive. Apple has previously shown interest in wireless power transmission tech, most recently filing a patent application for an "on-the-go" iPad Smart Cover that acts as a secondary tablet battery. In another property, the company describes an entire computing environment powered by near-field magnetic resonance.